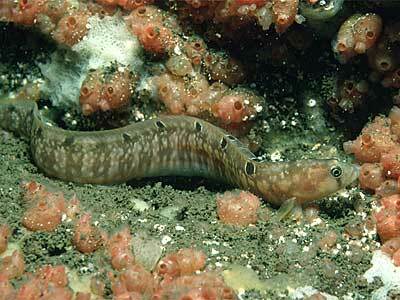 Description: The butterfish has a long, slender, eel-like body which is flattened from side to side. It has a very slippery skin and is difficult to pick up, hence its common name. The coloration is usually yellowish-brown with darker brown mottling. Like yarrell's blenny (Chirolophis ascani) there is a dark bar which runs from beneath the eye to the outer edge of the mouth. The most characteristic feature of the butterfish is a row of 9-15 black spots, each surrounded by a white ring, along the base of the dorsal fin. Adult fish are between 17-25cm in length. Habitat: The butterfish is common beneath boulders and seaweeds on the low shore and also sublittorally in a wide range of habitats. It frequently hides amongst seaweed or in crevices in rock. It feeds mainly on small crustaceans and worms. Distribution: This species is common and widespread all around Britain and Ireland. Similar Species: Eels, some blennies and rocklings are a similar shape, however only the butterfish has a row of black spots surrounded by white circles at the base of the dorsal fin. Picton, B.E. & Morrow, C.C. (2016). Pholis gunnellus (Linnaeus, 1758). [In] Encyclopedia of Marine Life of Britain and Ireland.